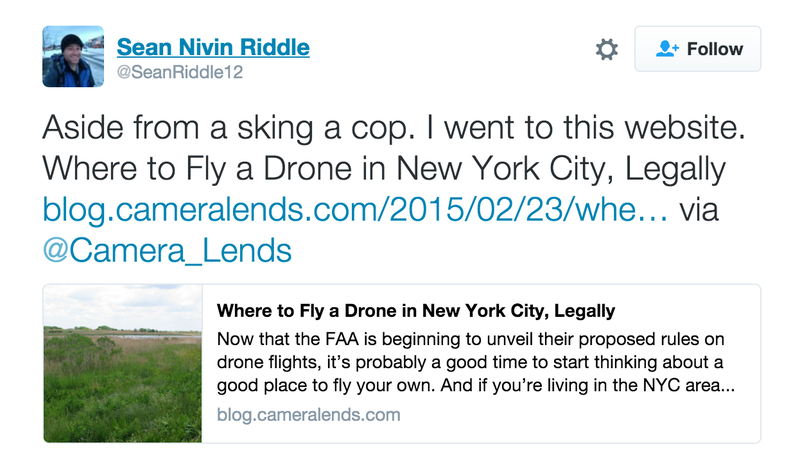 Flying a Drone Onto the Empire State Building is A Terrible Idea.. But not having a complete, authoritative map for pilots to check before flying is inviting disaster. On February 4th, 2016, Jersey City, NJ resident Sean Riddle allegedly flew a drone onto the Empire State Building and was subsequently arrested. This is probably the worst drone flying in the United States since NGA's Shawn Usman drunkenly flew one onto the White House grounds. Sean Riddle likely made a terrible and dangerous choice to fly a drone at night in a crowded East Coast US city. There is no reason that I can think of for flying a drone near the White House or the Empire State Building; drunk, or sober. It shows a complete lack of common sense. But, I did find a recent Tweet by Sean Riddle interesting. The site that Sean Riddle referenced had some general drone safety guidelines, and, a popular map from MapBox that depicted "No Fly Zones" for drones. As reputable and authoritative a source for Federal Aviation Administration regulations and safety as blog.cameralends.com sounds, perhaps one should try to find a more authoritative source than blog.cameralends.com before you fly a drone at night towards one of the tallest buildings in the most populated city in the United States. Here's a screenshot of the MapBox map near the Empire State Building as of the writing of this post. 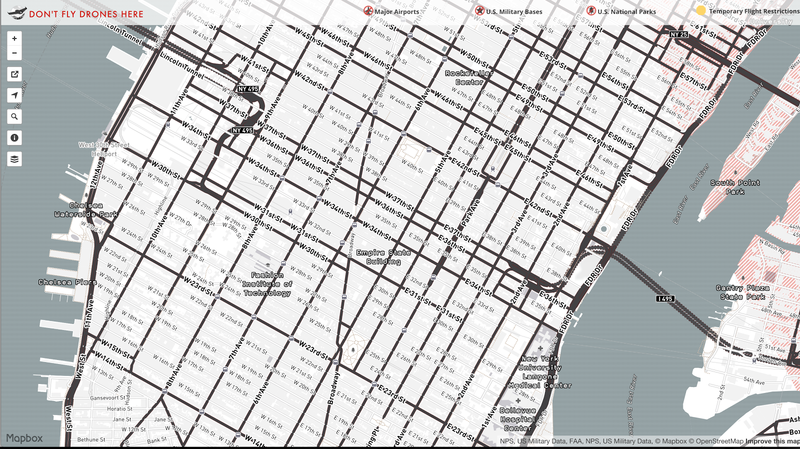 On the MapBox map, there was a 5 mile buffer around major NYC area airports (Newark, LaGuardia, Teterboro, JFK). The Empire State Building, and most of Manhattan, sat outside the LaGuardia 5 mile range. MapBox put the map that was used in the blog post together 2 years ago for a very good reason; there was no user-friendly map attempting to answer the question "Is it OK to fly my drone here?" and drones were exploding in popularity and capability. Affordable drones with amazing technology that even novices could fly reasonably well were showing up everywhere and the FAA didn't have a resource ready to answer this basic question. It wasn't MapBox's job to build the map; they were likely trying to show how it could be done and suggesting that it should be done by the FAA. With great transparency, MapBox shared their sources and methodology on this GitHub repo and if you work in or study GIS or mapping it was clear that this map was a combination of a 5 mile buffer around a selection of major airports, military bases, and national parks. If you followed the repository, you would have noticed that it hadn't been updated substantially in the 2 years since it was initially created. It was a useful resource to get a conversation going about the need for this type of map, but not a complete or authoritative one. And this brings me to my major point; in the absence of an authoritative and constantly updated map from the governing body that regulates and oversees the airspace, one can see why both Sean Riddle and blog.cameralends.com may have thought they were looking at a map that gave a definitive "Yes/No" when that was never the intent nor stated authority of the MapBox map. This past weekend, MapBox took down the "Don't Fly Drones Here" map and redirected the URL to the FAA's B4UFly page. Because finally, the FAA is answering the call to provide an authoritative map for drones with B4UFly but the reality is that the application is not yet fully ready nor consistent. Currently, B4UFly is only officially launched on iOS and in a beta for Android . I've been testing the Android Beta and found it rather slow and buggy so far. The iOS version appears to be a bit more stable. I searched for the Empire State Building in the app and was shown the following. If Sean Riddle had an Android device, and opted into the Beta, and waited for that opt-in to go live, and then downloaded the beta app and it didn't crash, or, he downloaded the iOS version for an Apple device, he could have seen that the Empire State Building is clearly covered by controlled air space over NYC from Laguardia and JFK (NEW YORK CLASS B AREA A). The Empire State Building is also within a 5 mile radius of 10 Airports / Helipads which according to the FAA a drone pilot is required to contact the tower if possible to alert them of the planned operation. It wasn't clear from Sean Riddle's Twitter statements if he did or did not call each of these airports. While the FAA has taken a long time to respond to the arrival of masses of drones it looks like we are finally on the verge of having an authoritative map to answer the question "Is it OK to fly my drone here?" Last week I was viewing a video on YouTube shot with a drone over Harpers Ferry, West Virginia. While pretty footage, it occurred to me that Harpers Ferry is a National Park. Since June 2014, National Parks have a memorandum prohibiting the use of drones without the permission of the park supervisor. Searching for Harpers Ferry in B4UFly only reveals that there is an airport within 5 miles. 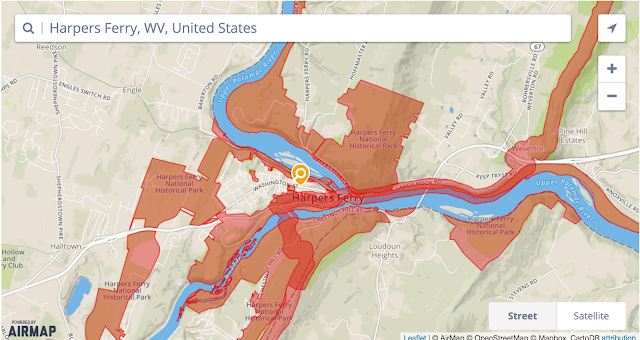 However, if you follow a link on the FAA's main UAS page to KnowBeforeYouFly.org and search for Harpers Ferry on the air space map, you'll see a clear "no fly zone" due to the borders of the National Park. Frustratingly, this map lacks the nearby airport that is present in the B4UFly app. The FAA is partnering with several industry associations to promote safe and responsible use of unmanned aircraft. The information contained in this website is for general information purposes only and it is subject to change without notice. The Know Before You Fly campaign, Association for Unmanned Vehicle Systems International, the Academy of Model Aeronautics, and the Federal Aviation Administration (collectively, “we”) endeavor to keep all information on this website up to date but we make no representations or warranties of any kind, express or implied, about the content, completeness, accuracy, reliability, legality, suitability or availability, with respect to the website or the applications, information, products, or services contained on the website, for any purpose. I'd argue that the map on KnowBeforeYouFly.org is clearly not authoritative, but it is certainly confusing when the official FAA app is called "B4UFly" and there is a very similar but non authoritative map on "KnowBeforeYouFly.org" which is explicitly called out and linked to by the FAA. What isn't clear from this search is if the FAA (Department of Transportation) is intending to include flight restrictions that are created by NPS (Department of the Interior)? Or, for that matter, any state and local restrictions. 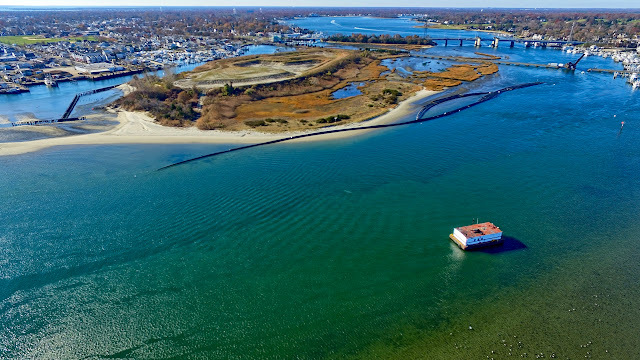 For instance, when I searched for Island Beach State Park in New Jersey in B4UFly, I saw the Special Use Airspace (R-5002G WARREN GROVE,NJ) covering the southern extent of the NJ State Park and a nearby airport. 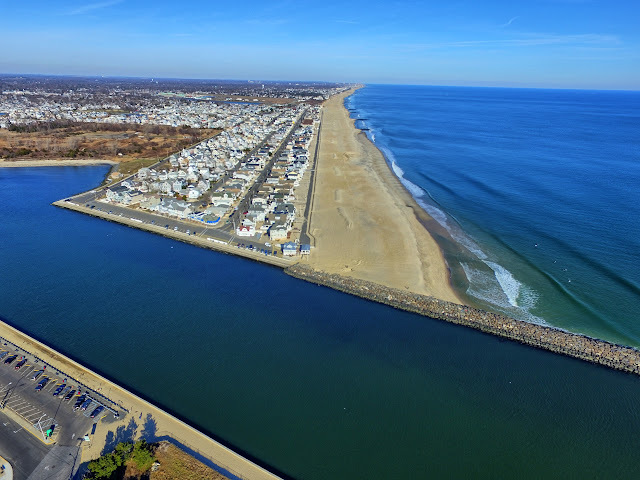 However, in July 2015, the New Jersey Department of Environmental Protection Division of Parks and Forestry State Park Service published a policy that prohibits the use of drones in state parks without the permission of the park administrator. Just like in the National Park, if I used B4UFly in the State Park, I'd incorrectly believe I was OK to fly assuming I'm following all of the other rules that apply to my operation. This is a mess and it makes it very difficult for drone pilots who want to follow all of the rules to operate safely and know where they can do so. We need a single place to find that definitive, authoritative answer. Sean Riddle likely did many things wrong when he flew his drone in NYC and onto the World Trade Center at night. He was likely flying over 400 feet, likely over crowds of people, possibly out of line of sight and likely didn't consider the impact of updrafts nor GPS / compass interference that flying next to the Empire State Building would subject his drone to. However, he isn't wrong that outside of common sense it is currently very confusing to figure out, "Is it OK to fly my drone here?"